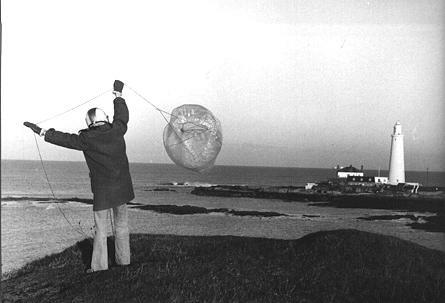 In the early days, FlexiFoil inventors Ray Merry and Andrew Jones, spent many hours testing and talking about their strange wind inflated wings during the early 1970's in England. 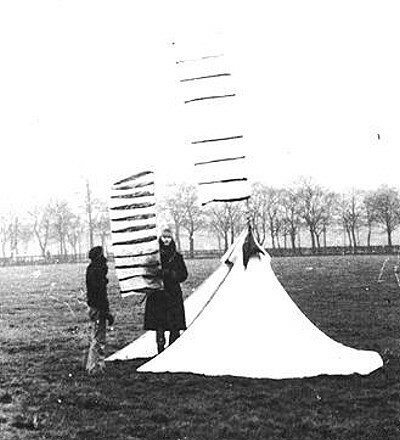 Seen here with the "Limpit", a Vinyl WigWam type shelter used as an operations base for early test flights. 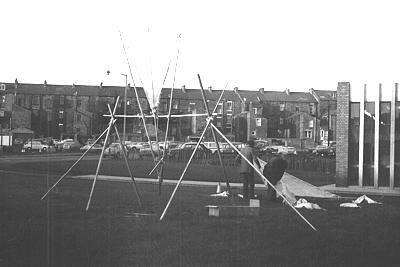 It was this structure below of bamboo, plastic sheeting, counter balance weights and string, that ultimately led to the Flexifoil Power Kite. Kites and kite flying were never even thought about during the very early stages of a project exploring the force of wind. 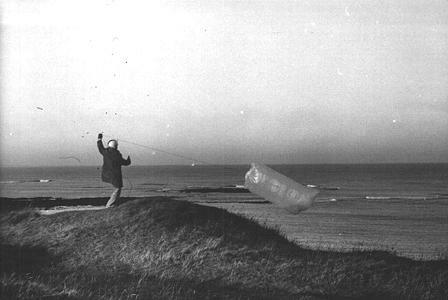 Photographs showing Ray Merry at Tynemouth in the North of England catching bags of air in 1971. As part of the experimentation process, Ray & Andrew constructed large plastic bags with small air entry holes to see how small these could be and still enable the bag to inflate. The bags were tethered on elastic rope which provided interesting aerial antics. The motorcycle helmet was not worn because this activity was considered dangerous, but rather it was windy and winter and any extra clothing was welcome! During the development stages of the first Flexifoils Ray Merry & Andrew Jones had many ideas as to how their invention might be used. 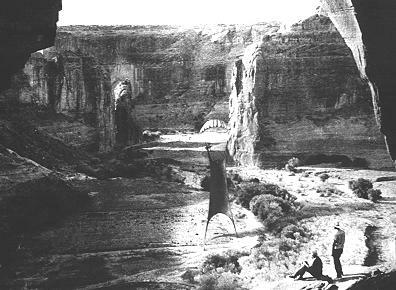 These two photographs show how large versions of the kites might have been utilized to lift large "curtains". Both kites and curtain membranes were drawn over photographs and re-photographed to get visualizations. 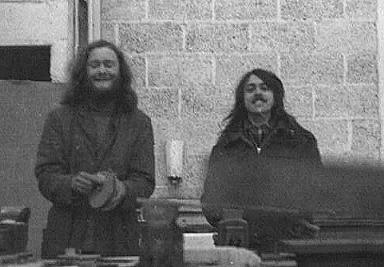 This is a rare photograph of Flexifoil inventors Andrew Jones (left) and Ray Merry. Taken in the early 1970's, it shows them "Hard at work" at the workbench on a winters evening. Needless to say, they don't look quite the same today! In the late 1970's and on into the 1980's, British recreational sailor Ian Day became intrigued with the notion of using Flexifoils to power a sail boat. More than that, to make it go very fast. He experimented on snow skis powered by a modest stack of 6 foot kites and commented that it was the fastest he'd ever been over snow. His main problem was stopping! 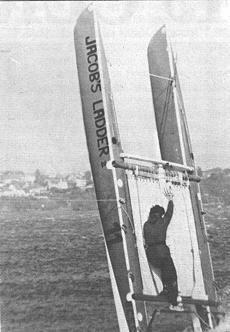 Jacobs Ladder became the name used on many of the craft kite-sailed by the two-man crew. Once, during the kite launch sequence, excess power could not be reduced and Ian became the first sailor to stand a catamaran on end whilst under sail! 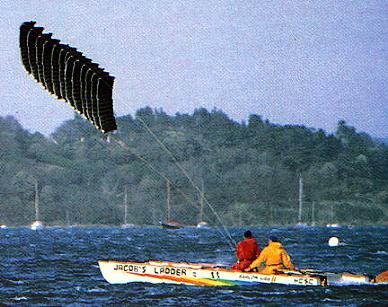 After the Flexifoil had become established as a dynamic stunt kite and stackable power source, many test were carried out on land and water to use it to harness the wind. In the mid to late 1970's Ray & Andrew spent time in the fields in Eastern England with a not unfamiliar kite propelled craft. 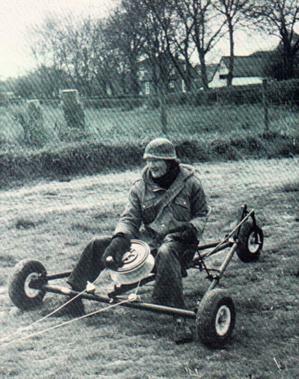 Opting for rear wheel steering and winch controlled Flexifoils, they were often seen careering across farmland. Sometimes in control, sometimes acting as a wind powered harvester! Though the rig shown is set up for one man piloting, it was often set up as a two man craft. The winch kite steering gear was used very successfully on Jacobs Ladder, the speed sailing catamaran operated by Ian Day. This boat still holds a world record for a sail powered vessel. 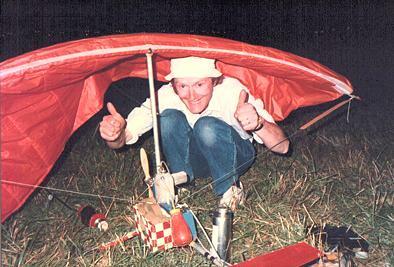 In the early 1980's, R&D work with Flexifoils turned towards free flight. Merry & Jones were urged to experiment with a free flying version of their unique wing by Dutchman Theo Van Dort. He was an R/C pilot with an interest in the project as a whole. On a misty English September afternoon in 1982 the first successful flight was achieved. Once again, a series of intuitive "accidents" produced the Windbag. At first, a conventional approach with standard wing and tailplane layout was not yielding positive results. It was decided to opt for a canard elevator and more power to get "unstuck". It worked, leading to a varied program of free flight experiments. Andrew Jones sheltering under a stripped down version of the Windbag. In the late summer of 1985 a stack of 153 Flexifoil Stackers was successfully flown from a ground rig supported by two fire trucks. Affectionately known as the Chicago Hook & Ladder stack, it was a great achievement on the part of the Chicago Skyliners Kite Group who provided many of the kites. 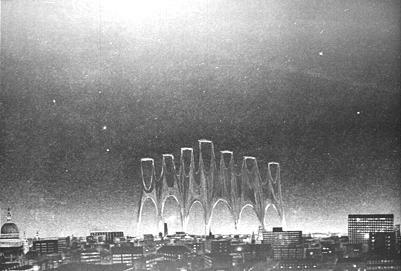 Under the guidance of Ray Merry and Andrew Jones, the stack rose into the air to a vertical height of 1,000 feet. The flight only being terminated by the failure of the flying line. It was pulled apart by the huge forces!